The first objective of meditation is the elimination of random thoughts. The second is the unification of the senses, leading to increased awareness and clarification. All of this results in an ultimate fulfillment and satisfaction. The techniques of Ashtanga Yoga, including asana, pranayama, pratyahara, dhyana and dharana, are also employed as techniques for meditation. When performed correctly, they can be used to delve deeply into the mind, in order to discover the mental causes of the dissipating tendencies within. In this section, we shall focus on strategies for clearing and stabilising the dissipating mind. Most students find japa malas helpful in meditation, and we shall therefore discuss them here. A mala is a chain with 108 beads, which a teacher may give to her disciple at initiation, along with a mantra. Some malas are carved from tulsi wood, which is a member of the basil family, and is considered to be holy by the Hindus. In order to use the japa mala beads, you should first sit in padmasana, or any meditative posture, and face the east if possible. Keep your spine erect, your shoulders back, and your face relaxed. Place your left hand on your left knee in jnana mudra. Close your eyes, and breathe in and out slowly and rhythmically for a few minutes, until your body feels relaxed. Your body should entirely in harmony with your breathing. The practice begins with what is called the meru bead. As you work your way through the japa malas, be sure to never cross the meru bead over the others. Once it is reached, turn it around and go back. Hold your bead in the middle finger of your right hand, and place your thumb on the first bead. The index finger and the little finger should not touch the bead. With each repetition of your mantra, gently roll a bead with your thumb towards your body, continuing until you have reached the end of the chain of beads. Then stop. 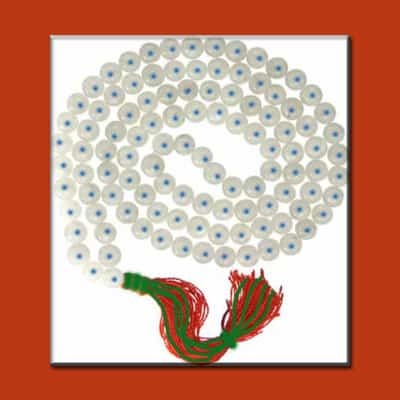 Turn the mala around using only your right hand, and begin, once again, to roll a bead with your thumb towards the body. In should be practiced if the mind is scattered and restless, and maintained until the mind is calm, relaxed and steady. If you find that your mind continues to wander, practice with the japa malas until it is settled. The best time for a japa is from 4am until 6am. Beginners should practice for ten minutes before progressing to a half an hour.